An electric monster with 4 Model 3 motors, one for each drive wheel, with an astounding 500 mile range (beating most people’s expectations). Fully loaded (i.e. 80,000 lbs total), it can accelerate from 0 to 60mph in 20 seconds. Unburdened, it can do 0-60 in 5s. What’s the point of this kind of performance, other than the ability to go up a 5% grade at 65mph fully loaded? In a traditional vehicle, the conventional wisdom is that an over-powered vehicle will kill your efficiency. And how can you make a 500 mile range electric truck without destroying your payload capacity? In an electric truck, efficiency and power are related in the opposite way you might expect. The truck shaped a bit like a bullet, with a drag coefficient of 0.36 (like a sports car instead of a “barn”) and an efficiency of better than 2kWh/mile. And the insane performance? Well, by running more motors in parallel, the effective power loss due to resistance in the coils is reduced since Power loss = I^2*R. Torque is proportional to current and number of motors, so if one motor with resistance R1 needs to generate torque T1, it requires a current I1, and thus a power loss: I1^2*R1. But if you take the same torque requirement and split it among 4 motors, the current for each motor is now just I1/4, and the power loss for each is: (I1/4)^2*R1 = I1^2*R1/16. All 4 motors in total have a resistive power loss of 4*I1^2*R1/16 = I1^2*R1/4, i.e. a quarter of the value of just a single motor. Additionally, the heat generated would be split among 4 motors, reducing the temperature of the windings and further reducing the coil resistance. Another instance in which superlative specifications, which would seem to be detrimental to performance, actually improve efficiency is in the battery size. Batteries are not pure voltage sources but contain “internal resistance” which limits performance and reduces efficiency under load. Doubling the capacity of a battery (by, say, adding an identical battery pack in parallel) thus has the effect of halving the internal resistance and thus halving the power losses under a certain load. Therefore, unlike the conventional wisdom which states that you should use the smallest battery possible, under some metrics adding a larger battery will actually improve efficiency. At proportionally low loads, discharge efficiency can be on the order of 99% or higher (source). If on the other hand, the smallest motor and the smallest feasible battery were used, energy efficiency would be lower. 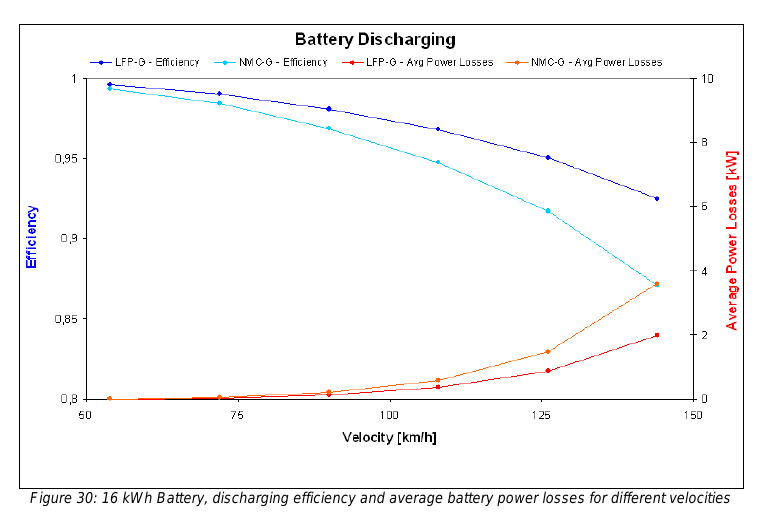 Motor efficiency, as the above map showed, can drop to mid-80% efficiency or lower. Discharge efficiency for the battery can also drop to 90% or so. Therefore, using the smallest motor and battery (and then relying on, say, a fuel cell or something) would be a false economy. Tesla claims a sub-2kWh/mile figure for the semi, a figure that other manufacturers (such as Nikola Motors) scoffed at. And let’s look in detail at the <2kWh/mile efficiency claim, starting with drag. Rolling resistance, for our purposes, requires a constant amount of energy per mile to move a certain load. The speed doesn’t matter (much…). Whether 1mph or 30mph, if you neglect air resistance, the rolling resistance will require you to expend energy to move stuff on Earth (although less on other planets like Mars…). This is basically the same thing as coefficient of friction, if you remember your first physics course in high school or college. Crr, the coefficient of rolling resistance, is technically unitless, although sometimes it’s expressed as kg-f/tonne-f (i.e. Crr times 1000), and sometimes it’s expressed not as a coefficient but as quantity with a unit, such as power in Watts (for a given load and speed) or force (for a given load). Unfortunately, this number seems really hard to find for typical commuter car tires (but I digress). The energy needed per unit length is calculated: gravity*Crr*load. g is 9.80665m/s^2, load is 80,000lbs. Some good semi tires with low rolling resistance have a coefficient of about 0.0045 (so 0.715871877 kWh / mile). But this is not an ultimate limit. A really, really good road bike tire may have a coefficient of about 0.002 (0.318165279 kWh / mile), which is in the range of rail (which has a rolling resistance–metal wheel on metal rail–of about 0.001 to 0.002 in real life conditions… although fundamentally it can be even lower). If you want to compete with rail, you’re going to have to reduce this as much as you can. But, of course, a semi truck is not a road bike. But there is one way to get even better rolling resistance: a wider tire. Most semi trucks use dual tires on each of the four drive wheels. But it’s also possible to combine the two tires into one. A “super single” tire can have as low as 0.0034 (0.540880974 kWh / mile ), significantly better than the usual low rolling resistance semi tire. Super singles also tend to last longer, and since they have more contact surface with the road, it’s possible they also have better stopping power and even lower road wear. They also can reduce weight (in combination with alloy wheels) by up to 1000 pounds. And 0.0034 is not a fundamental limit. Physics allows you to do better, as road bike tires prove. So this may be an area that Tesla invested in, and according to some rumors, Tesla is planning to use super singles on the Semi. That’s consistent with Tesla’s “<2kWh/mile" and with all the data Tesla has given so far and with fairly optimistic assumptions. But if they're using 55mph as a baseline instead and the more efficient tires and drivetrain with the slightly smaller trailer, then the figure could be as low as 1.16kWh/mile (meaning a 600kWh battery may even be realistic). 1.5kWh/mile I think it’s a pretty realistic figure, and so that’s what I’ll use. That works out to a 750kWh battery for the 500 mile version, which is $180,000 base. The 300 mile version is $30,000 less at $150,000. Does that mean it's 450kWh and thus the cost per kWh is only $100? I'm not so sure that's what it means, although that’s no show-stopper. I DO think Tesla has the ability to make super cheap batteries, but I think there's more to the story. Since Tesla is also going to be selling a bunch of Model 3s and Model S/Xes and PowerPacks and PowerWalls by then in addition to 5 years of chemistry improvements since that analytical model came out, it’s fully realistic that the learning curve will allow a $120/kWh figure to be achieved. Elon Musk has long predicted a $100/kWh figure once the Gigafactory was fully operational. That’s basically why the Gigafactory was and is being built. I think the biggest reason people have a hard time accepting even a $120/kWh figure (let alone $100) is that it breaks a lot of their dearly held notions about energy. At that price (and combined with solar cells at 19 cents per watt at the spot market), anywhere with sun is going to have cheaper energy than fossil fuels (unless you’re right above a gas field or something). But that’s a topic for another post. I will need to address the 7 cents per kWh that Musk promised. EDIT: Thanks to comments by James who pointed out I missed the factor of 0.5 in the drag equation. That makes the whole Tesla semi project way easier and should give Tesla a decent profit opportunity. It means only $120/kWh is needed and shrinks the required battery, which reduces the weight considerably and also thus reduces the required charging speed. That makes a huge difference. We’re talking 600kWh for the 500mile semi instead… Or perhaps allowing less efficient tires and less drive train efficiency or a larger 13.5ft by 104 inch trailer. Big difference; thanks for pointing that out! Curious to see your take on the electricity cost claim. I am sure they won’t be paying 40 cents through massive demand charges (another excellent analyst insight from Bloomberg). They can install solar themselves and have their own battery packs. Any grid energy would likely be a low and stable draw. With cheap stationary batteries and probably low utilization, I would guess their possible subsidy might be no more than 10-15% at most. One number conspicuously absent from Tesla’s presentation was the useful load of the semi. Diesel fuel packs far more energy into each pound than any battery. In the U.S. trucks are limited to 80,000 pounds. How much payload is lost if you buy a Tesla truck? I expect that we’ll see Tesla asking states to allow increased gross weight compared to diesel trucks. That will be addressed in later parts. There are multiple ways that Tesla can reduce other weight to make up for battery weight. You start with high efficiency, as that reduces the capacity of the battery you need. Then improve battery specific energy so it doesn’t weigh much. But remember you also don’t need that big Diesel engine and all the overhead that requires (exhaust, motor mounts, power transmission to the wheels, scrubber, etc, etc…). Overall, you can get the same weight as is typical for semi tractors today. So let’s not concern-troll about the Tesla semi’s weight just yet! How many places could you get the battery charged, and how many hours for the charge? I suspect that Tesla should have gone for a delivery van rather than a long distance truck. Electrical vehicles are happy to drive for 20 minutes, stop for 10 minutes whilst they are partially unloaded and then drive for 20 minutes to the next stop. At the end of the day they return to the warehouse to recharge. People pay vastly more for a semi than they do for a delivery van, and they are more willing to buy on brand and what would be extreme luxury features on any other commercial vehicle. That combination means that the margin is higher, and $10-20k difference in prices makes less difference to buyers, so you can add in that luxury without completely blowing out the top-line price. You saw the same pattern in their pattern of car releases: Sports car. Luxury sedan. Luxury SUV soft-roader. Regular large sedan. Great work, you did the same sums I did. It’s worth noting that their have been other demonstration trucks developed which got around these efficiency levels so its nothing that the the Semi industry should be supprised about. What about the guaranteed $0.07/kWh energy price from Megachargers, could Tesla as self proclaimed energy company pull a profit there over, say, 1 million miles? They’re promising 100% solar energy? I’ve seen lower cost being reportedly achieved, but can Tesla get it that cheap to the Megachargers? And since obviously fleet managers will want their own destination megachargers, how will that work? Seems like a nice opportunity to sell that product, or lease it as a service, per year including maintenance and/or per kWh, for having a private Megacharger rather than one shared with the neighbor that also just bought a Tesla truck. How much payload is lost if you buy a Tesla truck? Jerome confirmed last Saturday that the Tesla Semi would be able to carry the same load as a diesel truck. But there were 2 or 3 prototypes so they might have had different tyres. True but a 500 mile range is borderline for a semi. It is 10 hours at 50 mph. Aside: We’ll see the reality once they are in the wild. Thus, to go 500 miles at 65 mph would require a delta E of 1525 kWh. But of course the battery capacity has to be larger than the expected delta E. Thus Ecap = delta E/(SOC top-SOC bott). If we assume 80% to 20% SOC, then battery capacity is 2541 kWh. Assuming 0.055 kWh/kg energy density, we’re looking at 100,000 pounds of batteries–greater than the allowed weight of a semi truck. Not reasonable IOW. Sure you can tweak the values in the equations, but bottom line is your battery mass is going to cut into your useful payload. Meanwhile, what about running costs? At 15 cents/kWh and diesel at $3/gallon, your costs are going to be about the same; but the Tesla loses because it can’t haul as much freight. ps: looking forward to your comments on the 7ct/kWh promiss.